GenScript's Bis-Tris precast gel series are high performance polyacrylamide gels that are designed to separate a wide range of protein sizes by electrophoresis. The gels are cast in a neutral pH buffer that minimizes polyacrylamide hydrolysis and increases gel stability. They also run at neutral pH which minimizes protein modification compared to Tris-glycine gels. 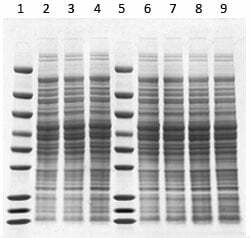 GenScript's gel series include-SurePAGE™ Gels which are the premium, higher resolution and reproducibility gels, and ExpressPlus, good quality and very cost-effective gels. ExpressPlus and other major gel types. Free samples of SurePAGE™ (Including MOPS buffer powder) available. Contact us freesample@genscript.com. SurePAGE™, Bis-Tris gels are a major upgrade from ExpressPlus™ gels with enhanced casting technology that results in better resolution and consistency. 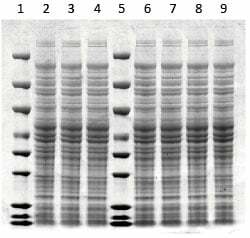 Figure 2: SurePAGE™ gels offer superior band resolution compared to competitors and the homemade Tris-Glycine gels. Lane 1 and 5: protein marker (MM1397), 5µl. Lane 2,,3,4,6,7,8 and 9: E. coli 10ul cell lysate. For best result, we recommend using 4XLDS sample buffer (M00676) as the sample loading buffer. An alternative sample buffer is 5x SDS sample buffer (MB01015). 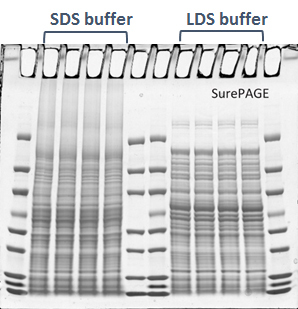 The figure below shows that compared to SDS sample buffer, LDS sample buffer enables better separation of the protein samples. Buy 4 or more boxes of SurePAGE Bis-Tris Gels and get a FREE T-shirt. Call us at 732-885-9188 to place your order or email us at product@genscript.com. to obtain a quote. Hurry while supplies last! Offer valid only with a quote and applies to SurePAGE Bis-Tris Gels only. Get a FREE T-shirt *Offer valid for US and Canada customers only. Order 10 boxes or more and save $10/box! What's the difference between ExpressPlus™ and SurePAGE™ gels? SurePAGE™ is a major upgrade from ExpressPlus™ with improved casting technology. 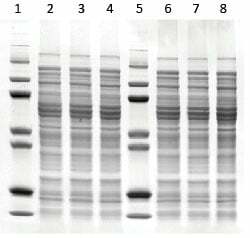 SurePAGE™ offers better band resolution and consistency compared to ExpressPlus™ gels. How long does it take to run a ExpressPlus™ or SurePAGE™ gel? It depends on the concentration of the gel. Usually it takes about 50 minutes at 140V. Shorter running times can be achieved if a higher voltage is used, but higher than 180V is not recommended. What running tanks are ExpressPlus™ and SurePAGE™ gels compatible with? Any tank that is designed to run 10cm x 8cm (length x width) precast gels. See product page for the list. Is this gel stable at room temperature? Yes. SurePAGE™ and ExpressPlus™ gels are stable at room temperature for at least three months. However, it is recommended to store gels at 2-8℃ to maintain their highest quality. Which sample loading buffer should I choose? We recommend using 4xLDS sample buffer (M00676) as it gives better sample separation compared to SDS buffer, see product page for detail. 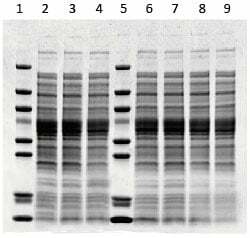 What running buffer should I use to run the gel? 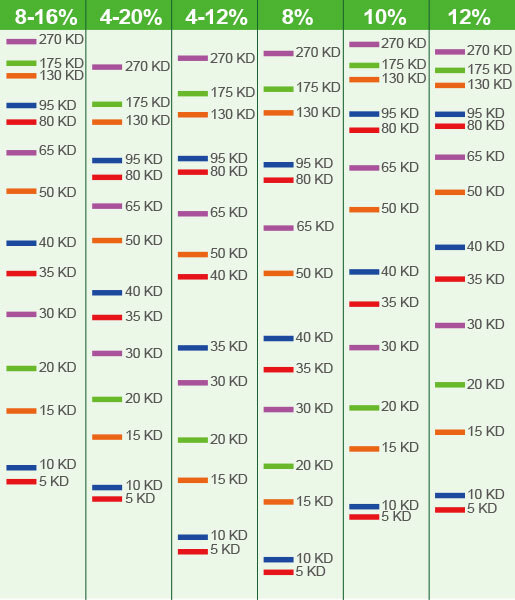 We recommend MOPS for large and medium proteins, and MES for small proteins. Tris-glycine buffer is NOT compatible with GenScript's precast gels. What's the buffer I should use to transfer the gel? We recommend Tris Bicine transfer buffer (M00139). 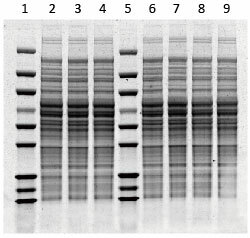 Why do some parts of the gel become sticky following protein transfer? This is caused by the concentrated polyacrylamide on the top part of the gel. It will help if this part of the gel is cut and removed before transfer. Will overnight destaining affect the resolution of the band? It depends. We suggest using a destaining solution consisting of 15% methanol and 10% acetic acid in DI water for overnight destaining. 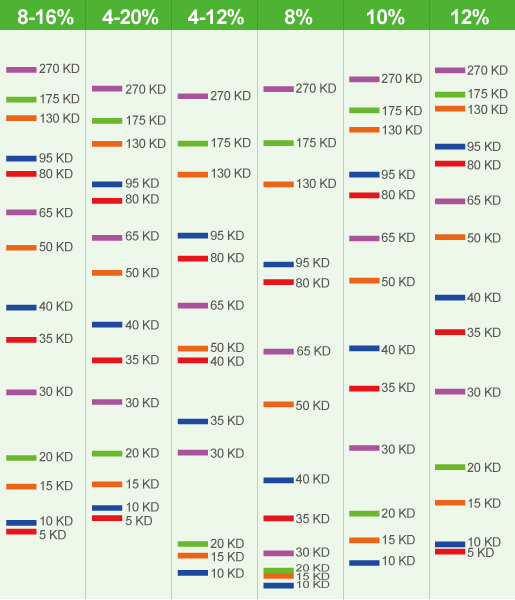 Sample overloading Reduce sample loading amount, especially when the sample contains many kinds of protein.